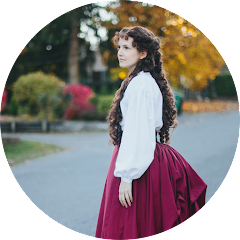 Over the course of the last *cough* year and a half *cough* I ventured into a new area of costuming for me, the Victorian era. More precisely the early bustle era: the 1870's. Before this I had read a bit about the era (though more about the 1860's) and had seen countless other costumers works on the era. But this was my first time trying to do something this big. And I learned a lot from it. This post is going to be a compilation of a bunch of things I learned from this journey/things I would do differently next time. The Victorian era, particularly the 1870's, is great for beginners because they can easily cover up their mistakes with lots of trim. I made so many mistakes with this dress. Like a lot. Some of which were not able to be recovered and had to be scrapped completely, such as my first bodice. 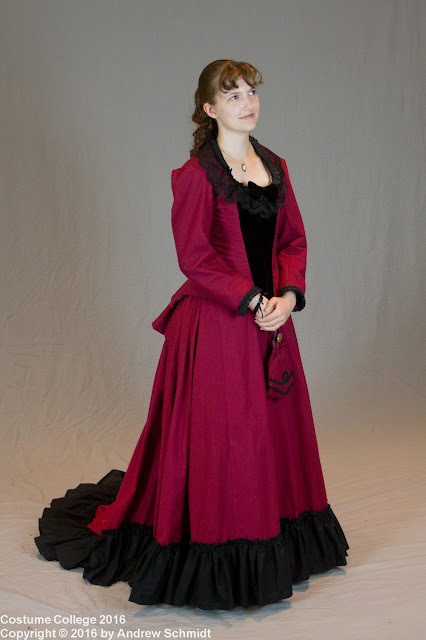 But due to the fact that the Victorian's loved their trims, I was able to hide a few of my bigger, armature mistakes such as my un-even dress hem. Yep. That black ruffle along the bottom of my skirt was a backup plan because I accidentally cut some of the panels to short. Start with printed patterns. Don't try to scale up patterns from a book if this is your first time venturing to this era. That ended up giving me a ton of trouble on the skirt and bodice, which is why I ultimately had to re-make the bodice. Do not underestimate the power of having a lot of trim on your dress. The biggest thing I see looking at this dress now is the severe lack of trims. I put what I thought was a lot at the time, but it seriously needs a lot more. You can hem your skirt up higher than you think. I hemmed this dress so it was barely off the ground at the front (maybe an inch off the ground). 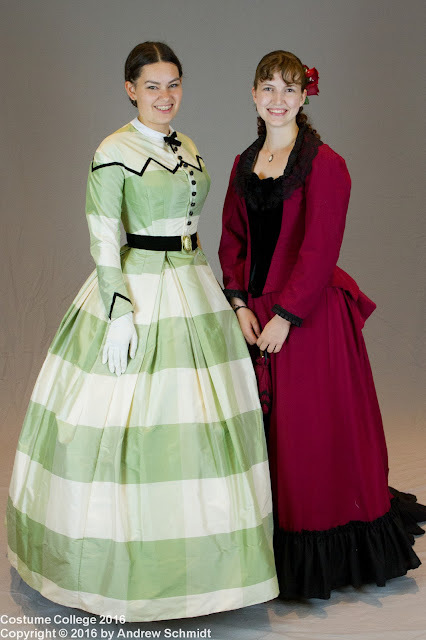 After talking with my friend Michaela, who has a bit more experience with historical costuming that I do, I learned that I would have been good with 2-3 inches off the ground. It ended up working out okay for me this time, but in the future I'll be hemming just a little bit higher. Don't stress about being perfectly historically accurate. When I set out to make this dress I wanted it to be as accurate as possible, which ended up putting a lot of pressure on myself and I ended up procrastinating a lot. I lost motivation for the dress about half way through because of this. At that point I decided that I wasn't going to stress about it being perfect (at that point I knew it wouldn't be) and I told myself that I just needed to finish it. I had period appropriate material, the right underpinnings, and to the best of my ability the right silhouette for it (although not perfect). It's okay to not be perfect as long as you finish and learn from it. Costuming to me is about learning and having fun either while making and/or (though hopefully both) wearing the costume, and once I remembered that I was more motivated and actually finished the thing! Having cute shoes that match the era (even if they aren't entirely historically accurate due to budget limitations) will make you feel like your outfit is complete. I purchased a pair of Funtasma lace up boots to go with this since I couldn't afford the American Duchess shoes (and because I wanted lace up boots), and putting them on made the whole thing feel so much more real. It's amazing what a pair of shoes can do! 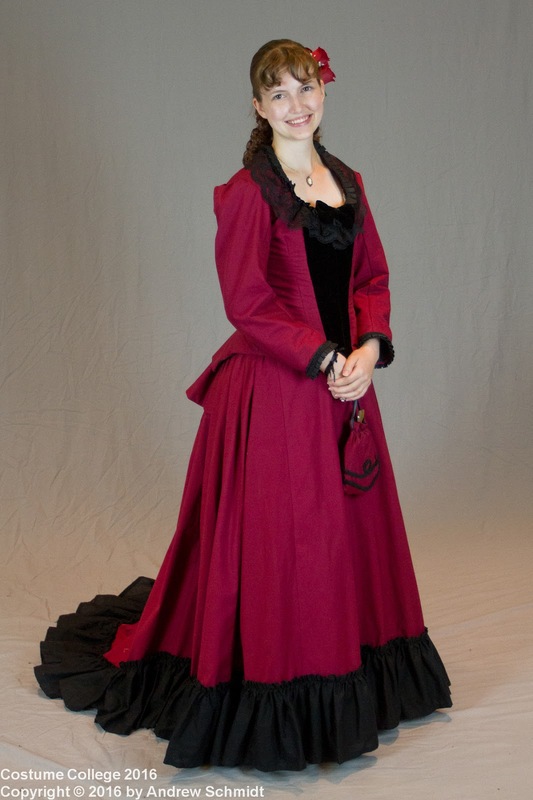 And I have to add, wearing a bustle with a train is one of the funnest things I've ever worn. Ha, I remember talking to you about the hem length, and after saying 2-3'' off the ground, I was like, "Did I really just say that?!?" It sounds totally ridiculous; I mean come on, floor length means floor length! Until floor length = you can't walk. Also, when you're wearing a hoop it gives you more room to go a touch shorter, because the expanse of your skirt gives the appearance that it's plenty long. So maybe a exaggerated a little, in that not every dress can be 3'' off the ground and still appear floor length. I think mine was 3'' off the floor (aiming for 2'', but something happened *shrugs*), and I would prefer it longer. It also depends on how much practice you have wearing it. I'm comfortable taking smaller steps, but when I first started 3'' or even shorter was like a hardship. Dress with a train = goals.